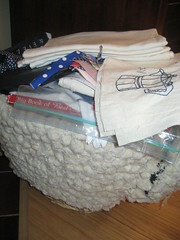 Here is a sneak peak of my sewing basket. I have so many projects still lingering it has overflowed into another bag that sits along side, then a plastic bag full of another project and then the pirate quilt was hanging out in a closet. Nice huh? Looks completely in control……just like me. Tomorrow I am executing operation escape kids. I am leaving the critters in Sydney with the visiting Grandparents while I escape for a week with my husband. I keep pinching myself not quite believing it is true. I suspect I will have re-entry issues on the domestic front meaning I don’t think I will want to come back! In saying that, I know I am going to miss them like CRAZY! Have a great week! Tea towels are packed if I can stand to stitch in between cocktails. I finally organized the quilt backing for the long awaited pirate quilt. I am going to send it off to be professionally quilted and hopefully will have it back in a month or two to show off. 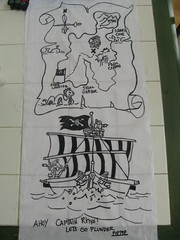 Here is the final result of the pirate drawing my Dad did that I traced onto part of the backing. Still not managing to finish very much on the craft front! 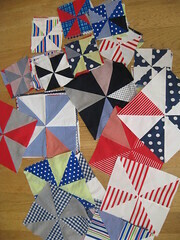 I just laid out the baby quilt and discovered three of the small blocks were missing. How did that happen? I swear I counted them a hundred times! Back to the cutting board. One small victory to post about. 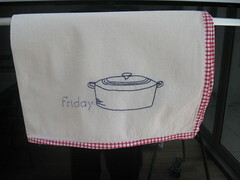 I made some binding and finished one of the tea towels. Yeah! I feel like I need to high five someone because I actually finished something! Hurray for me! My parents brought over some of my dresses from the 70’s. They are in really great condition and I will post some photos of Sloan squeezing into some of them. The fabrics are so great. My favorite is the floor length, lime green number with the mushroom and fairy design on it. Go 70’s! I’ll post the individual photos of the dresses on Flickr for a closer look. Grandparents are in the house and having two extra sets of hands is such a help. We are having a lot of fun and the grand kids are getting spoiled! Sloan has decided to start walking for them too. At 17.5 months it is high time she gets moving on her own two feet. The Mosman Scouts is hosting a fundraiser with Picklemouse Corner this weekend at The Barn in Mosman. 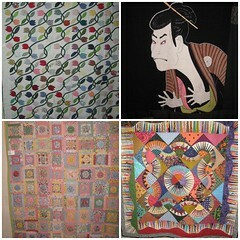 Local quilters are showing some of their quilts to help raise money. The tulip quilt is one of the quilts I donated for the show. I made this quilt about ten years ago and it took two years of off and on work. It was a big project and I love the vintage feel of it. The other photos are of some of my favorites from the show. The New York Beauties is by one of the teachers, Chris Judd, at Picklemouse corner. I took her Mariners Compass class two years ago and she was an excellent teacher and a beautiful quilter. It is always so inspiring to see other quilter’s work of patterns, color and subject matter. I missed the Sydney quilt show last year and cannot wait for this years show. Hopefully I might even have a few projects completed so I won’t feel completely guilty buying more fabric. Have a great weekend!